Imagine – someone comes to you saying they have a load of company issue cards from short lived UK charter operators from the late 1960s. I guess most collectors would at least take a look, and many would hope they had stumbled on quite a valuable horde. You take a look at the cards – they feature Britannias and a 707. You have to explain that the Britannias are highly collectible but the 707s are best used up as postcards. Why? 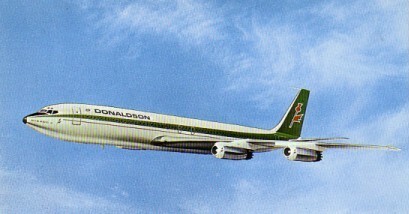 Because they are the two cards shown from Donaldson International Airways. Donaldson themselves lasted 10 years but only 7 of these were as airliner owners, starting with Ex British United Britannia G-APNA in 1967, adding its sister PNB in ’69 together with ex BOAC OVC and OVF from 1969 and 1970. The card shows OVC “Mikado” , PNA “Juno” and PNB “Carillon”. 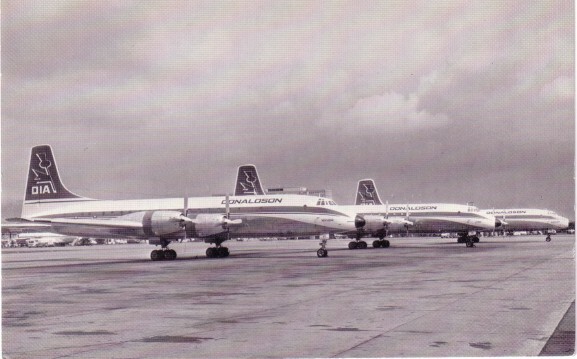 The 707s were ex Pan American , 2 being acquired in 1971 and 2 more in 1972. Three were converted to freighters. The last major contract undertaken was operation of 2 707s for Iraqi Airways pending delivery of their own 707s. 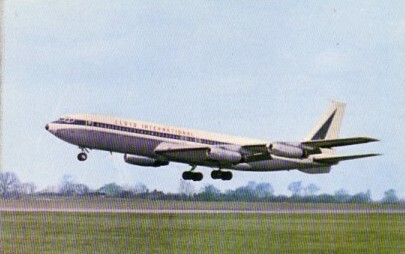 On termination, the 707s were repossessed by Pan Am and British Midland took over the Iraqi contract. With “Donaldson 707” having entered the language of the hobby it was perhaps inevitable that there should be a standing rumour to go with it. Basically this says that during the very short period of Donaldson 707 passenger operations under their own name, (1971-2) this same card was available but with space on the back to fill in date, flight no, origin and destination. If anyone out there has one such I guess we would all like to know in case its worth while looking at the back of those that lurk in sale boxes worldwide.